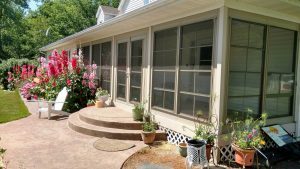 One of the most enjoyable and value-adding improvements you can make to your home is the addition of a three season room. This kind of semi-enclosed space features floor-to-ceiling windows that offer clear views of the outdoors with better protection from the elements than a screened-in porch. Adding such a versatile, aesthetically pleasing space to your home provides many benefits that turn your house into the dream home you’ve been wishing for. The biggest benefit to adding a three season room to your home is the increase in usable living space, which enhances your lifestyle and your home’s value when you’re ready to sell. Many homeowners struggle to adapt their houses to accommodate growing families or the space needed for new hobbies. A professionally designed three season room gives your family the additional recreation and storage space you need to enjoy your home to the fullest. Research has shown that spending time in nature improves your mood and overall well-being, but for many it’s difficult to make time to get out into the wild, even if it’s just their own back yard. Bugs, allergens and finicky weather are all excuses we use to stay indoors. A three season porch allows you to take in the sights and sounds of nature from the comfort of your own favorite chair in nearly any kind of weather. Whether it becomes a new workout space, a home for your plants or a Zen space to curl up with a good book and a cup of tea, the addition of a three season room means a brand new space in your home to express your personality. Many homeowners use this flexible space as a home for interests they otherwise simply wouldn’t have room for. Whatever its purpose, your three seasons room is a space that you can call your own and is an opportunity to let your personality shine through. You don’t have to move into a new house to have the bigger, more functional, and more relaxing home you’ve been dreaming of. With the help of professional design services, a three season room may be exactly what you need.